What Now - Page 3 of 11 - Or maybe, What's Next? Searching memory might be compared to throwing the beam of a strong light, from your hilltop camp site, back over the road you traveled by day. Only a few of the objects you passed are clearly illuminated; countless others are hidden behind them, screened from the rays. There is bound to be some vagueness and distortion in the distance. But memory has advantages that compensate for its failings. By eliminating detail, it clarifies the picture as a whole. Like an artist’s brush, it finds higher value in life’s essence than in its photographic intricacy. 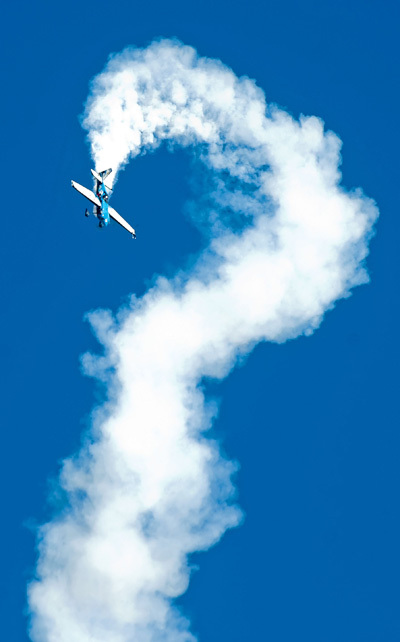 The three most common expressions in aviation are, “Why is it doing that?”, “Where are we?” and “Oh Crap”. If God had meant man to fly, he’d have given him lots more money. The Hammerhead Turn is a fun maneuver. It’s a challenging combination of all three planes of motion, plus the fourth dimension of time: there are two quarter loop components to pull in pitch changes courtesy of the elevator, a roll component (to counteract torque at low airspeed and asymmetrical lift) to exercise aileron control, and of course the yaw component where we get to kick the rudder to turn around at the top. Plus it gets us close to the zero airspeed regime. Timing the turn around. 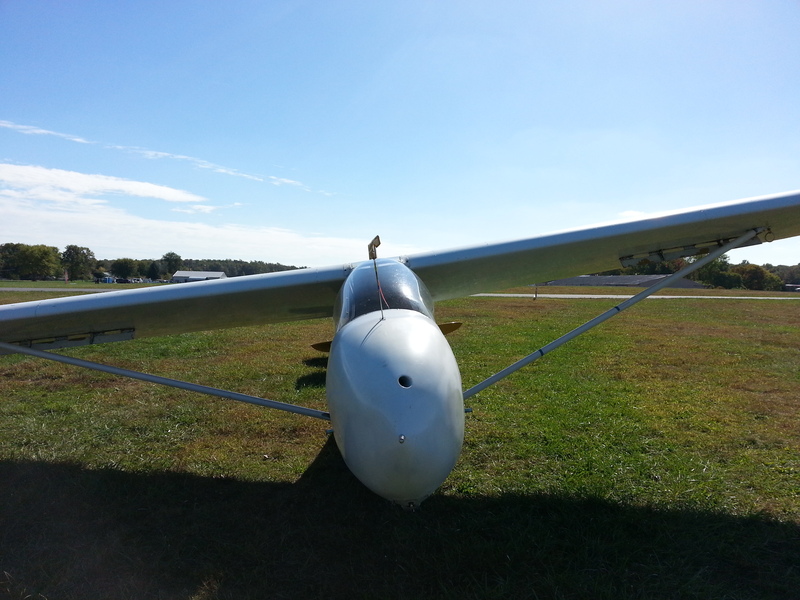 Done correctly, the airplane pivots around its center of mass in less than a wingspan. Too early leaves the airspeed too high and the airplane “flies” through a wingover, instead of pivoting. Too late and it falls backward into a sloppy tailslide. Find the exact mix of right- and then forward-stick to keep the turnaround in the same vertical plane. The outside wing is traveling faster so it’s generating more lift, than the inside wing, which results in left-rolling tendency that is counteracted with right-stick. Forward-stick counters the gyroscopic force from the spinning propeller trying to pull the nose up. Timing the turn stop. Without right-rudder the nose will swing through the bottom, past vertical. The engine and propeller make an effective pendulum weight. Timing the vertical down-line and nailing the 4g pull-out to finish on target in both airspeed and altitude. It looks so easy from the ground! Here is video evidence of my first attempts…preserved for all time (at least until electrons are obsolete). I hope to look back at this clip 5000 hammerheads from now and shake my head at how anemic my skills used to be. 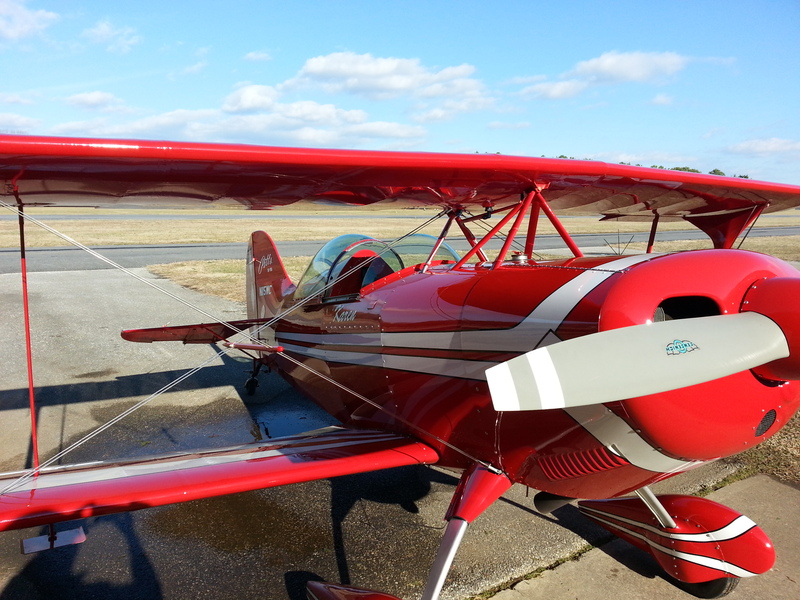 Part of my journey into aerobatics includes Spin Training. 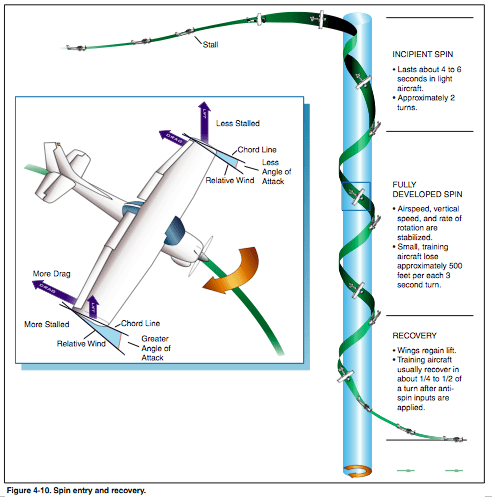 Spins are the downward spiraling flight airplanes go into when the wing stalls (i.e. stops producing lift) without coordinated rudder input to keep them level. Spins are a required part of aerobatic competition. Accidental spins are associated with a great many aviation accidents. One would think they’d be integral to pilot training. And they are…sort of. We’re taught about them including the aerodynamics involved, recognition & avoidance, and the control actions to recover. But actually doing spins is no longer required by the U.S. Federal Aviation Regulations to be a certified pilot. We talk about them, get tested on them, but don’t actually do them. We’re required to perform stalls (the wings must be stalled before a spin can occur) but only just the onset of the stall, before recovering to normal flight. I won’t go into the great debate here but the teaching of spins is the aviation equivalent of religion or politics (or even worse: the pc-mac debate! ): everyone has an opinion and they are mostly strong and very likely to run the entire gamut. There are those for whom the spin is the modern equivalent of the flat earth: a fear born of uncertainty and a place best left unexplored. It takes all kinds but in their defense, spins are perhaps the least understood of basic aerodynamic phenomena and have been for over a hundred years. 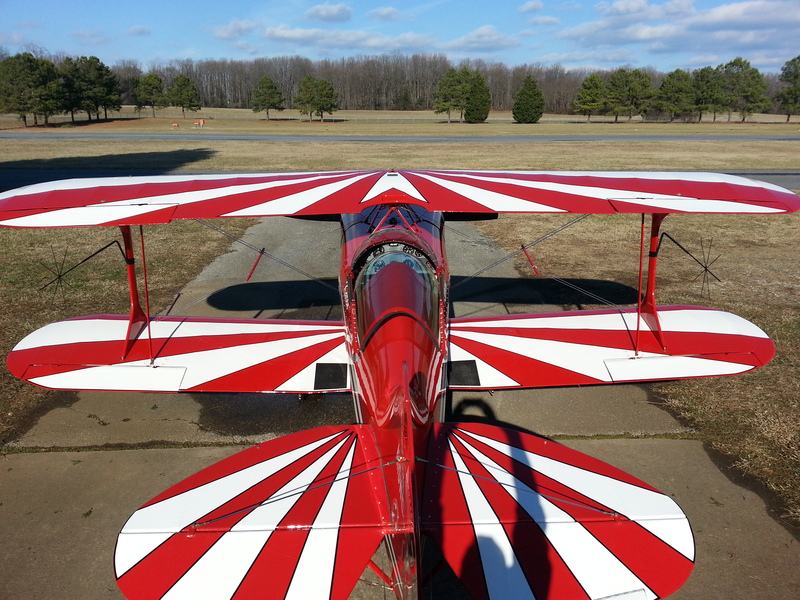 For aerobatics, spins are required in all their flavors. But for the moment I don’t want to talk about spins; I want to talk about ’emergency recovery’ from accidental spins. Part of trying new things is the certainty we will fail regularly and often. 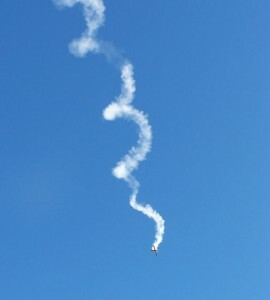 In trying new aerobatic maneuvers, one likely outcome of failure is simply falling out of the maneuver and into a spin. We practice with lots of altitude so recovery is easy, until we can perform the maneuver perfectly every time. This mastery is what allows airshow performers to dazzle us safely and consistently. Every second of their performance is only made possible by thousands of hours of preparation. During the journey toward that mastery, we need to prepare to fail. That’s where emergency recovery training is worth its weight in gold-wrapped diamonds set in Californium-252. Bill Finagin teaches a variation of the Mueller-Beggs recovery. My primary flight instructor did a good job of making me not fear the spin 20 years ago, but I never knew how fun they (and emergency recovery training) can be. My understanding at this point is basic and growing. My confidence is growing by leaps and bounds!